Though the fire that broke out at the Riverview Hotel at around 3:30 a.m. on February 5, 1918 was within sight of the Elmwood fire hall, it might as well have been on the other side of the city. The fire, believed to have started in the kitchen of the hotel, set off the fire bells immediately. Fueled by 30 mph winds the blaze quickly made its way down the block and across the street. Aside from the Bank of Commerce and LaSalle Hotel, most of the other buildings on that stretch of Nairn were made of wood and clapboard, some with just a thin brick veneer. They "went up like tinder" according to a newspaper report. At one point the fire brigade had six to eight separate fires burning on Nairn that cold February night. A number of buildings and businesses were impacted by the fire. Piecing together newspaper articles, photos and Henderson Directory entries, this is what I believe the block looked like. Here it is in map form. 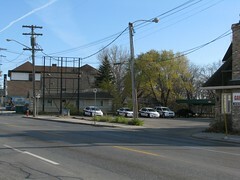 The Riverview Hotel, 322 Nairn Avenue, including the barbershop located on the main floor and a house directly to the east (left of the photo) were completely incinerated. O'Connell, his wife and six children, (all of six years of age and under), scrambled to safety from the first floor. So did John Lauzon, a resident and brother to Mrs. O' Connell. Six other residents of the hotel made it out alive. The couple who resided in the doomed house, also the owners of a razed restaurant right across the street, also made it out. This is all that was left of the Riverside Hotel, note the Louise Bridge to the left. The building in the distance which had a post office, pharmacy, at times doctors offices and a couple of empty spaces, was not badly damaged but has since been demolished. The Mulvey Block, (with sign on top), had a hardware store on the main floor. The retail block to the left had a butchers and restaurant, the owners of which lived in the home next to the Riveside Hotel. and possibly a dry cleaners / tailors. Both buildings were damaged but survived. They have since been demolished. The building was badly damaged when flames came across the street and set the brick veneer structure alight. Seven families that lived upstairs narrowly escaped and were taken in by neighboring residents. On the retail level was a tailor and confectioners and a couple of empty storefronts. The building was torn down. 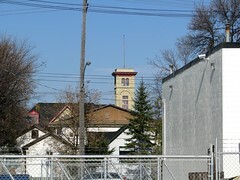 To the left of the Lauzon Block appears to be Fong Lee Chinese Laundry. It was completely destroyed. The building to the left of the laundry is the ca. 1906 Bank of Commerce. Despite the imposing brick and stone facade, the window sills and doors on two sides caught fire. Three employees of the bank who lived upstairs had to escape out a back window. This building still stands. The empty lot where the Riverview once stood. 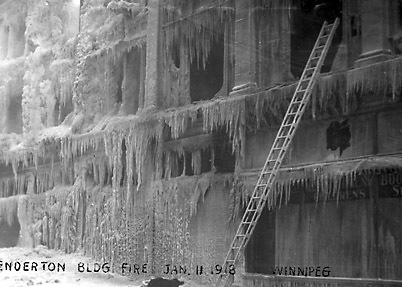 A Free Press reporter visiting the site the following day wrote that the scene was 'a near holocaust' as highly piled snow on or around buildings saved the fire from spreading to residential and smaller commercial structures across the back lane. As with any fire, it is the story of the people and their tales of heartache and heroism that are often forgotten. Four people died and many had near escapes. Here are some of their stories. 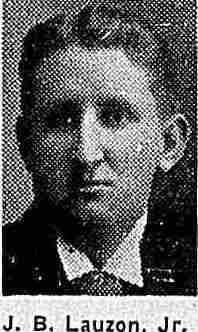 John Lauzon was credited with going back into the fire to scoop up more of the infant O'Connell children. He survived and lived to be 52. Miss Nina Goodwin was staying at the hotel after visiting a friend who worked there. By the time she awoke her room was completely filled with smoke. She wrapped her hands in clothing, broke the window and jumped the three storeys to the ground below. She was admitted to St. Boniface hospital in good condition with bruises and a broken ankle. George Watreck was the barber. He survived but with burns to the face and hands. 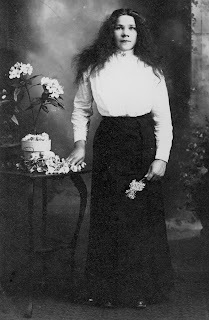 Rosie Moran was a barber and part time kitchen girl who lived at the hotel. She awoke to find her room on fire but managed to escape with serious burns to her legs and body. She died after what must have been an agonizing two weeks later at General Hospital on the night of February 20, 1918. As for determining who died on the night of the blaze, it was determined after doing a roll call the next morning. Two days after the fire officials began to find remains that were charred beyond recognition. The first body located was believed to be Pat Timmins. He was a private with the 78th Battalion (Winnipeg Grenadiers) and recently returned from the war after being injured and honourably discharged. Timmins roomed at the hotel and escaped the fire but but ran back in building to save those trapped inside. Despite the fact that he was discharged, he was still given a full military funeral from the 78th Battalion. The Returned Soldiers' Association and War Widows Association paid the costs. The second body found was likely that of Marina Chebeaux (also found spelled Martha and Shebau, Shebans, Shebus) (45) who was a private nurse who emigrated from Paris five years earlier. She had been working as a nurse to the O'Connell children for 3 1/2 years. Remains were found in the basement of the hotel directly underneath her room which led inspectors to assume that they were hers and that she likely died in her sleep. The third and final body found was that of Michalena 'Lena' Huckan (25). Huckan came from what is now Ukraine around 1910 and began working as a kitchen girl at the Riverview a year before the fire. She was engaged to be married. Thea aftermath of the Riverview fire is still a bit of a mystery. The city was already on high alert when it came to large-scale fires. 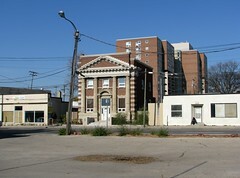 In the ten days prior to the Rivervew Hotel fire, the Caldwell Block and Enderton Block both burned down. Ironically, less than 12 hours before the Riverview fire broke out City Council had passed a motion to create a special fire commission to investigate if there was anything more the city could do to prevent them. The provincial Coroner McDonnell had a number of fire fatalities on his hands. The night Rosie Moran died he had still not decided whether or not to call an inquest into the Riverview fire. A brief mention in the paper a few days later said that an inquest had been called but there is no follow-up media stories that I can find. 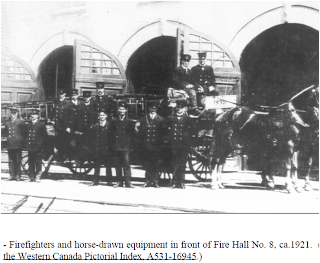 Searches at the provincial archives and other inquiries have not turned up any records of an inquest into this fire. What happened to the O'Connell family, owners of the Riverview Hotel? After the fire they moved to a house at 637 Bannatyne Avenue. On the morning of May 21, 1918 Mr. O'Connell had a case of tonsillitis and walked to the General Hospital. They operated later that day but he died under anaesthetic. I could find no record of Mrs. O'Connell. Thanks for the thorough, detailed research! I grew up in that area, and even remember going into that tiny old Commerce Bank branch as a child, across from where the fire took place -- but never heard of the Riverview disaster until now. I own a small shoppe at 310 Nairn and this history lesson has been excellent! we are right next to the old Riverview site (where our parking is)I was looking for the history on this location and street and this has been the best resource. My great-grandfather was J.B. Lauzon, Mrs. Curley was my Great-grand aunt and John Lauzon was J.B. Lauzon's son, my great-grant uncle. 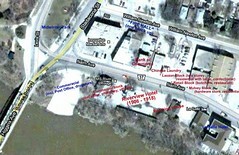 I knew that that Lauzon block burned but had no idea about the Riverview. Where did you dig up that information. I have a newspaper article from my grandmother's scrapbook, but it does not indicated where the article came from and it is quite different to what you have posted. This is all so interesting for me. Thankyou. My post on the Riverview Hotel fire was pieced together from dozens of newspaper articles and other sources. It was actually a family member of Lena Huckan who provided some of the initial information. If you email me at cassidy at mts.net I can go back through my computer and send you copies of some of the newspaper articles that I used. JB lAUZON wa my great great grandfather and Emma Curley was my great grandmother. tried to email you but it didn't send.